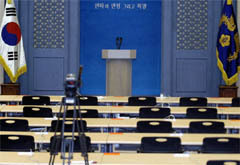 The briefing room at the Blue House, the presidential offices in Seoul, is now open to all news organizations. As a vigorous, debate-filled democracy becomes entrenched here, South Korea is rapidly dismantling the press club system, an enduring symbol of the collusive relationship between the government and the news media. Starting a year ago at the presidential offices, known as the Blue House, press clubs — in which reporters from major media outlets excluded other journalists and decided what to report, sometimes in conjunction with government officials — have been eliminated in one government office after another. Where they survive, as in Seoul's Police Department, they are expected to go soon. Instead, shiny new briefing rooms have been built, their doors flung open to all. Although journalists and government officials are still groping for a new balance in their relationship, most believe that the changes will lead to the emergence of something rare in East Asia: a fiercely independent press. 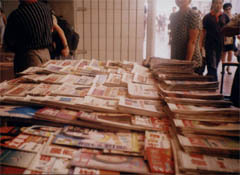 Disappointed by the nation's three largest "Cho-Joong-Dong" conservative newspapers, President Roh Moo-Hyun often stressed the need for press reform. 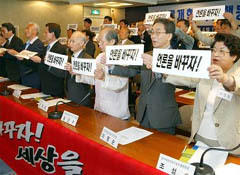 The so-called Big Three dailies have been criticized by liberal politicians and citizens alike for their "negative" coverage of President Roh and his reform-minded party. Currently, lawmakers of the ruling Uri Party are drawing up measures for drastic and comprehensive press reform. The dismantling of the deep-rooted press club system, a vestige of the Japanese colonial rule that ended in 1945, resulted from the confluence of several events. 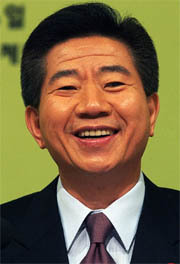 In 2002, President Roh Moo Hyun was elected despite the fierce opposition of traditional outlets, especially conservative newspapers and television networks. At the same time, Internet-based alternative sources of information, popular among the young and generally supportive of Mr. Roh, have emerged as rivals to the traditional media here in the world's most wired nation. The speed of the change is particularly stunning because, in Japan, the press club system survives intact. Hyun Seung Yoon, 39, a reporter for The Korea Economic Daily and the former vice president of the Finance Ministry's press club, which was abolished on Dec. 29, said that in the past the government and the media were united. "Fundamentally, it's better now," Mr. Hyun said. "It's healthier now. The relationship that existed before was a collusive one." 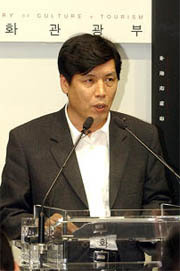 When Mr. Roh came to power a year and a half ago, a priority was to make the government's relationship with the media more open, and to give "equal opportunity to all media," said Jung Soon Kyun, the minister of the government information agency, who traveled to the United States, Japan, Germany and Britain to study how each government dealt with the media. 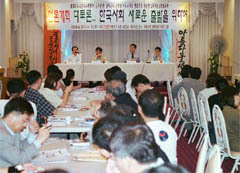 South Korean journalists and political leaders discuss ways of reforming Korean press in a recent meeting. The press club system had allowed the big media outlets to "monopolize information" and sometimes "offer and receive personal favors," said the minister, a former reporter. For Mr. Roh, a political outsider who had not won the backing of the mainstream media during his election campaign, the abolition of the press club system also worked to his political advantage. Under the old system, members of the major news outlets controlled membership and expelled organizations that failed to abide by club rules. The club decided, sometimes through a senior member acting as a liaison with the government, what news to focus on, what to play down or, in some cases, what to suppress. The government paid for all the expenses the press club incurred, including phone bills, and even provided a secretary for the members. Until a few years ago, the government also paid for the reporters' air fare, hotel bills and other expenses whenever the president traveled. Under the new system, the government charges each reporter assigned to the Blue House about $50 a month to cover various fees. With reporters for any news organization, big or small, free to register, the number of Blue House reporters has increased to more than 300 from 90. Press clubs exist all over the country, from the Blue House to the ministries to police precincts, said Lee Jae Kyoung, a journalism professor at Ewha Womans University and a former television reporter. "The loser was always going to be the reader, the people's right to know," Mr. Lee said. Years ago, when Mr. Lee was a cub reporter covering a police precinct, the press club discovered some bad news involving a local tea manufacturer, he said. Instead of reporting the news, the club's senior members met with company officials, pocketed some cash and then treated the club members to a lavish dinner and drinks, he said. South Korea's press club system, like its bureaucracy and legal systems, was a holdover from Japanese colonialism, said Youn Jung Suk, a professor at the Sejong Institute specializing in Japan-Korea relations. After the end of World War II and the end of Japanese colonialism, South Korea's American occupiers decided to retain the press club system. 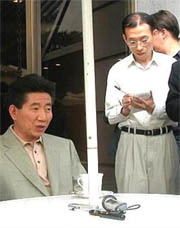 "It was easy to control Korea through this system," Mr. Youn said. South Korea's military leaders and a largely compliant press also shared the same belief, experts say, and so the movement to reform the press club system started only after South Korea began democratizing in the late 1980's. In Japan, a de facto one-party state for the last half century, only maverick politicians in a few places, like Kamakura and Nagano, have abolished the press clubs, saying they are not appropriate in a democracy. Press clubs still exist in government agencies, companies and institutions all over the country, curtailing the nature and level of information available to the public. The media revolution in South Korea has been almost completely ignored by Japan's own media, even though almost all have bureaus in Seoul. Japan's Newspaper Publishers and Editors Association argues that press clubs have officially been opened to non-members since 2002, though most Japanese journalists will acknowledge that, in practice, little has changed. President Roh Moo-Hyun talks with reporters covering Presidential Blue House. Hiroshi Wada, an official at Japan's newspaper association, went so far as to deny the changes occurring here. "We checked the Korean situation and we do not think press clubs in South Korea have been abolished," Mr. Wada said. "It is that they allow everyone's participation freely, but press clubs still exist." He added: "So it is not that Japan is more conservative with regards to press clubs. We understand that South Korea has caught up with us." Here in South Korea, there had been previous attempts to abolish the press club system, notably under former President Kim Dae Jung's administration. But the resistance from the established media was too strong. But in recent years, Internet-based news services, like OhmyNews.com, rose to challenge the big media outlets, and their influence has grown, particularly with the young. In 2001, one of OhmyNews's reporters was barred from attending a news conference at Inchon Airport because he did not belong to its press club. Oh Yeon Ho, the news service's chief executive, sued and won. "Only a few years earlier, people's acceptance of privileged media had been embedded in our culture," Mr. Oh said. "Now the idea of abolishing the press club has become mainstream." In fact, Mr. Roh granted his first domestic interview as president to OhmyNews, signaling the beginning of a new era. The changes have been hard to swallow for the mainstream media, but most acknowledge that they have been positive. "Without the press club system, we can no longer maintain embargoes or — it's an extreme example — even abolish news items," said Shin Kyoung Min, deputy managing director for MBC, a major television network. "Inside the press clubs, we did sometimes do that, though not often. The fact that everything is now open to all the media, that's a good change for everybody."